Never in a million years did I think that Phil Joel would front a band again and sign to Word Label Group, a major label, to deliver easily one of my favourite EP’s of 2015. 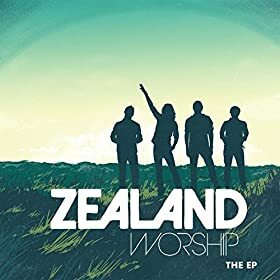 While we as a site reviewed Zealand’s EP release way back in June when it was only available via their website, this newly written review for their iTunes debut of their EP (7 tracks instead of 6, with the introduction of “Good Good Father”) continues to firm my assertion that Zealand, as a worship band with enthusiasm, heart and poignancy, is by far one of the most passionate bands out there currently, when compared to other like Rend Collective, Crowder and The City Harmonic, to name a few. Previously the bass player in the now Michael Tait fronted Newsboys, Phil’s energetic personality and quirkiness is what makes Zealand a four-piece outfit certain to be unique and popular as the months continue to roll on. Home to artists like Skillet, Switchfoot, for KING AND COUNTRY, Meredith Andrews, Sidewalk Prophets and needtobreathe to name a few, Word Label Group’s signing of Zealand continues to make this artist roster a strong one. From “You Awaken My Soul” to “That’s Who You Are” and the newly recorded “Good Good Father” (originally recorded by Bethel Music), The EP stands tall alongside The Unmaking (Nichole Nordeman) and Only You (ShineBright) as one of my favourites EP’s of 2015 so far. While you can see the in depth review of the album here, I’ll highlight a few tracks before discussing “Good Good Father”. Starting off the EP with a 2 minute introduction full of synths and electric guitars to bring us into a crescendo which is “You Awaken My Soul”, Phil and the rest of the band invite us to declare alongside them to God in an outward expression of us allowing Him to wake our souls in ways we may never have imagined or even envisaged before. The poetic lyrics of the chorus of how ‘…You awaken my soul, oh I’m in love, I’m in deep, my heart is Yours, it’s Yours to keep, word’s just can’t explain it, all I know, is You awaken my soul…’ is enough on its own to bring in listeners and keep their interest, with Phil’s distinctive New Zealand accent as well as the Newsboys/Peter Furler/Audio Adrenaline musical atmosphere that is contained, not only in this track, but throughout the EP as a whole. “That’s Who You Are”, quite possibly the most radio-friendly track aside from “Good Good Father”, pictures who God is, and with the comfort in the words sung by Phil that ‘…You are the rest for the weary, the hope and the healing, God above all things…You are the truth that is standing when the world is changing, You are forever, Lord of it all…that’s who You are…’ we can rest assured and be comforted that God is our constant when the world around us is changing. “Saviour” and “Greener”, though not necessarily as radio friendly as the rest of the EP, still impact with powerful instrumentation and Phil’s powerful vocal as worship takes front and centre in the declaration that God keeps saving us on a daily basis (“Saviour”) and Phil also reminding us that God is indeed the grass that is greener, greener than the situations we are in (“Greener”). “Lead Us To Your Heart”, the final song on the EP, is an almost 5 minute encompassing a moment of awe and poetic emotion as Phil is longing to draw near to God in all He is. Declaring alongside the band that all we want is God, is what the theme of not only the song but the EP as well, and is a well recorded and produced melody to finish off the EP with. ‘…I think the message within the message of this song is so important for now, for this day and age. We are so living in such a me-centric society, it’s the day and age of the selfie. If we want to know what life’s all about, we’ve got to get our eyes off ourselves and on the Author of Life, and that’s God, and He’s good. He’s a good and loving heavenly Father, and He has good plans for us. And if we can let that truth resonate in who we are, game on…’ “Good Good Father”, originally written and recorded by worship band Housefires, is now reworked by Zealand into a 3 minute radio melody full of energy and powerful guitar riffs and heartfelt singing as the band deliver arguably one of the most soulful, stirring and passionate worship performances of the year so far, since Lauren Daigle’s “I Am Yours” way back in April 2015. With Phil declaring that Christ is a good good Father, which is who He is, and that we are loved by God, which is who we are; we are daily reminded to always stand firm in this truth, that in spite of us, we are loved because of who He is. Also recorded by Big Daddy Weave on their own album Beautiful Offerings, “Good Good Father” is a melody, just like other worship songs like “Forever” (Kari Jobe), “Closer” (Bethel), “This is Amazing Grace” (Phil Wickham) or “One Thing Remains” (Kristian Stanfill) that have exploded in popularity in previous years, that’s certain to be popular in years to come. While Zealand have recorded the first rendition of the melody, expect future recordings in months to come. ‘…the focus isn’t on me or the band and I love it! Hopefully we can be a part of a firestarter movement of worship that goes beyond the sparks of a corporate worship moment to where people experience and enjoy God everyday…’ Standing at 7 tracks, Zealand’s debut offering of songs is something to remember and to continuously play on your music player for hopefully months to come, as Phil and the band present something standout and powerful. While Phil wasn’t necessarily a worship artist even when he had his own solo career, Zealand nevertheless is one of my favourite new artists currently, alongside I Am They, Lauren Daigle and newcomer Schyler Dixon (sister of Colton Dixon). While Phil isn’t necessarily new to the music industry, expect Zealand Worship to be present on WOW Hits 2017 (“Good Good Father”)…but then again what do I know? Listen to the song and make a judgement yourself. Kudos to the band for such an emotive and encouraging EP of worship songs, hopeful to land in Sunday services across many churches around the world in the upcoming months ahead. Previous PostTV Thursdays, Food Fridays and Sentimental Saturdays – Creative in the KitchenNext PostTop Twenty Favourite Songs of 2015…So Far!